Should you use gut or nylon strings? Welcome to the second installment in a series of posts about pedal harp strings. In my last post, I discussed some of the structural differences between gut and nylon strings, and how these differences translate to differences in sound character. To recap, gut strings do not flex as much as nylon strings when played, resulting in a cleaner, more prominent fundamental pitch. Nylon strings stretch laterally when played, resulting in a more complex sound, with a weaker fundamental and a more prominent array of partial pitches or overtones. This difference in elasticity also translates to a difference in intonation. In my opinion, the intonation of a string (i.e. how “in tune” the flat, natural, and sharp positions are, relative to one another) can be set more accurately with a gut string than a nylon string. In other words, in general, a harp that is strung in gut will play more in tune than one strung in nylon. Yes, it turns out that the extra expense of a gut string does make a difference. But this doesn’t mean everyone should string their harps in gut in every octave. There are other factors at work, which vary by octave. So let’s focus in on different areas of the harp. From the fifth octave A through the third octave on any pedal harp, I HIGHLY recommend that all harpists use GUT strings. Why? First and foremost, they have a far superior sound over nylon strings. since nylon strings flex more, I believe they dissipate some of their playing energy, and lose their power to vibrate the harp’s soundboard as much as a gut string will. It is very difficult to get any volume out of a nylon string in these octaves, especially in the fourth and fifth octaves. If you try to play the string really hard, its elasticity will cause it to slap against a disc and cause a buzz, and if you play it mezzo forte or below, it won’t produce any sound.If you do play a nylon string hard enough to get some volume, all the extra lateral stretching I mentioned will mean prominent overtones, which will cloud the fundamental, meaning the pitch will sound like several pitches at once. In addition, as I said, nylon strings cannot be regulated as accurately as gut strings, especially in the sharp position. With their greater tendency to stretch, nylon strings require a higher degree of grip, or twist, on the discs, to hold them in position. Greater disc grip translates to a sharper pitch, so the regulation on a nylon string in the third through fifth octaves will tend to be sharper than on the same harp strung in gut. So, in my opinion, you do get what you pay for, and it is worth the extra money to use gut strings in the third, fourth, and fifth octaves. I don’t necessarily give the same advice for the first and second octaves, however. We’ll focus on those in the next post. Gut or Nylon Strings: Does it Matter? Most new pedal harps come from the factory strung in nylon in the first (top) octave, and gut in the second through fifth octaves. 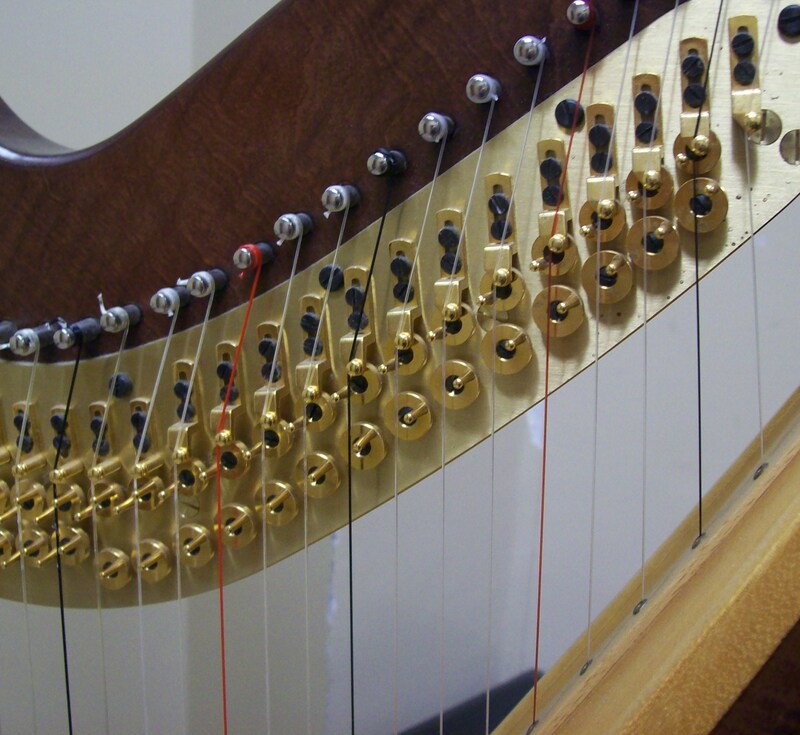 Lever harps that use pedal harp stringing and tension, such as the Lyon & Healy Prelude, Troubadour, and Ogden, and the Salvi Ana, are normally delivered with nylon strings in the first and second octaves and gut strings in the third through fifth octaves. When it comes time to replace a string (or a whole set), harpists realize they have choices. Strings are available in both nylon and gut from the top the way down to fifth octave A. And, wow, gut strings cost five times as much as nylon strings. Is the cost of a gut string worth it? I’m going to address this question in a series of posts, and show that the answer to this question varies by octave. First, a little bit about the differences between gut and nylon strings. Note for note, nylon strings are more elastic than gut strings, meaning they stretch more when played. Think of the difference between a rubber band and a piece of cotton string or twine. If you stretch a rubber band, and then pluck it like a harp string, it will give, or stretch more, then snap back when you let go. If you hold a piece of string taut, and pluck it, it will stretch far less, offering your finger more resistance, until you let it go and it snaps back. While harp strings are neither as slack as rubber bands nor as stiff as cotton string, nylon strings act more like rubber bands and gut strings act more like cotton string. This difference in elasticity translates into a different sound character in nylon and gut strings. While we usually say that a string produces a particular note, each harp string actually produces a multitude of notes when played. The most prominent note is known as the fundamental. This is the note we name the string after, and the primary frequency at which it vibrates. However, a string in motion actually vibrates at a variety of frequencies. These secondary frequencies are known as partials, harmonics, or overtones. When you play harmonics on your harp, you are isolating one of these partials, specifically the the one an octave above your harp’s fundamental. In practice, gut strings tend to have a stronger, cleaner fundamental tone, while nylon strings have a more complex sound, with more emphasis on some of the partials and a weaker fundamental. I believe this is because a nylon string not only vibrates when played, but also stretches and contracts laterally, to a greater degree than a gut string, causing its various partials to sound more prominently. Whew, that’s enough acoustics theory for one post. These behavioral differences in gut and nylon strings translate into differences in sound quality and character on the harp, and we’ll examine these in the next post. How Often Does a Harp Need Regulation? Does your pedal harp need regulation once a year? Every other year? Only occasionally? The answer, of course, is “it depends.” It depends on how much you play your harp, how strongly you play, and how high your standards are for sound and intonation. What causes a harp to go out of regulation? Time and use. Over time, the pedal felts become compacted where your pedals rest against the notches in the base. Under continuous string pressure (close to 2,000 pounds on a full-sized pedal harp), the soundboard pulls up slowly and the neck twists slightly. As the harp is played, constant vibration can cause parts to work slightly loose, resulting in noises you didn’t hear before. As parts age, some can lose their initial strength and require adjustment to function properly. Frequent use and moving can also result in breakage to fragile action parts, accidental movement, and other minor hassles. As a harp gradually goes out of regulation, it gradually loses playability. The strings will start to snap against the discs instead of being held firmly in place. The sharp pitches will start to sound out of tune. How quickly you notice these changes depends, again, on how you play and your tolerance for and sensitivity to pitch issues. Professional harpists tend to have their harps regulated more frequently because they are the first to notice losses in the harp’s playability. Students and casual players, on the other hand, may not notice a loss in performance for a longer period of time if they play with a softer touch. The the losses in playability that a harp experiences tend to begin at the extremes of its range. In the top octaves, the intonation is most sensitive to any change in the discs or string condition. In the bass wires, the changes in disc rotation that happen as the felts compact are more pronounced. For this reason, too, more experienced harpists who use the entire harp will notice problems more quickly than newer players who work mostly in the harp’s mid-range. So, what does this all mean? If you are a professional, harp major, or otherwise frequent player with a strong playing style, consider having your harp regulated every year, or at least every other year. If you just play for fun, every two or three years is fine. You may go even longer before noticing problems, but I recommend seeing a technician on some kind of regular schedule so that he or she can help spot and avoid larger problems before they become an emergency. You may have heard that you need to replace your strings before a regulation. Why, you may ask? Do you have to change all of them or only some? You’re hiring a technician. Why can’t he or she do them, for crying out loud? Let’s explore the answers to these questions. I generally recommend that harpists replace the first and second octave strings on their pedal harps at least two weeks prior to a regulation appointment. The reason for this is that in the upper register of the harp, string condition has a strong bearing on the accuracy of pitch regulation – that is on whether your harp remains in tune when you change pedal positions. In this high register, where the strings are very short, any change in the position of the harp’s nuts and discs will have a noticeable effect on pitch. The more a disc “grips” a string, or pushes it at an angle, when the disc is engaged, the sharper the pitch will be. The less a disc grips a string, the flatter it will be. All strings develop divots over time at the exact points where the discs engage them. Essentially, a string slowly wears away at the point of contact, thereby slightly reducing the disc’s grip on the string. this reduction in grip may not have any effect on 3rd, 4th, and 5th octave strings. With their relatively long speaking lengths, reductions in grip have less of an effect in relation to the overall length of the string. In the first and second octaves, however, the grip reduction caused by worn strings is significant relative to the short length of each string. In plain language, on worn strings, the natural and sharp positions will tend to be flat even if the open string is in tune. While replacing all the harp’s strings can certainly make it sound better, for the purposes of regulation, your harp benefits the most from new first and second octave strings. Now, why does the technician want you to do this ahead of time? Because new strings don’t hold pitch, and it will be difficult to accurately calibrate the action to play in tune if the string itself is stretching like a rubber band. It’s not that technicians don’t want to change strings for you. We would be happy to have the additional work (and the additional labor charge). But in order to do the best regulation possible on the day of your appointment, the strings should be installed ahead of time, then tuned regularly until they are willing to hold pitch reasonably well. If you know you need your harp restrung AND regulated, talk to your technician ahead of time about dropping the harp off early. If he or she restrings and then tunes it aggressively for a few days (rather than two weeks), it should hold tune well enough to regulated. Any harp that’s in regular use – especially one that gets moved a lot – is going to collect its share of scratches, dents, and dings. Some harpists accept these as a fact of life and overlook them. Others tear their hair out at the slightest mark. Most likely you fall somewhere in between. You hate that that music stand fell on your soundboard, but you can’t change the past, right? Well, in some cases, you can. There are experts in finish touch-ups who can make these blemishes on your harp’s finish invisible – or nearly so. Just how invisible can depend on the nature and the location of the blemish (and the skill of the touch-up person). But there is nearly always something that can be done to improve the look of a harp that’s been around the block a few times. If you live near a harp dealer or harp builder, you may have access to someone with harp touch-up experience. But what if you don’t? If the harp resources in your area are slim, I recommend checking with area piano technicians to see who they refer for touch-up work. Any touch-up artist who gets referrals from piano technicians will be used to working with musical instruments. Some touch-up techniques involve spraying a finish coat or two of lacquer over the repair, and you’ll want to avoid getting lacquer sprayed on your strings or your harp’s action or levers. For this reason, you’re best off working with someone who has experience with musical instruments. The local guitar repair shop may also have an experienced touch-up artist on staff or someone they can refer. If you can’t find someone through these channels, furniture dealers can usually recommend a touch-up artist. The common harp finishes, nitrocellulose lacquer, polyurethane, and shellac (on older harps), are the same finishes used on a lot of commercial furniture. If you work with someone who is more used to furniture than instruments, talk to them about the importance of keeping overspray off your strings. Offer to mask parts of your harp off ahead of time if they are not willing to. The bottom line for finding good touch up artists is: ask around. Get referrals. The finishing trade is an unregulated profession, and anyone can say they know what they’re doing. It’s really easy for someone who is untrained or inexperienced to make your harp look worse than it did before. Take the time to find out who is the best professional in your area. You’ll be glad you did. Let’s look at each of these points in a little more detail. A pedal harp regulation always includes replacing the pedal felts, even if they don’t look ripped or worn out. Pedal felts compress over time. In addition to making your pedal action louder, this actually throws pedal rods and the playing mechanism out of adjustment. Your technician will replace the felts before doing any adjustments, to bring the harp closer to its original specifications.After the felts are replaced, the pedal rods may need a slight adjustment to compensate for the normal “bellying,” or slight pulling up of the soundboard that occurs over time. The next step in a harp regulation is locating and eliminating unwanted noise. Your technician will move the pedals or levers to different positions and play each string, listening for noises that weren’t eliminated by the felt and pedal rod adjustments described above. While it’s not always possible to eliminate every unwanted noise a harp makes, many annoying sounds can be eliminated. Finally, the technician will check and optimize the harp’s intonation. He or she will play each string in each pedal or lever position, compare the pitches on an electronic tuner, and make adjustments to insure that the half-step increments between each position are as perfect as possible. How often does a harp need regulation? That depends on how much you play, how hard you play, and how high your standards are. Most busy professional pedal harpists have their harps regulated once a year. Part time or casual players and new students can usually wait two to three years or more. Lever harps require less maintenance. I generally recommend having a lever harp serviced once every five years or so, as long as the player isn’t experiencing any problems.